Today was a very cool day! As I arrived, I snapped this shot of Hercules, right before she dove off the ledge in pursuit of a small bird. You can see her red leg band clearly and can almost make out the letter. 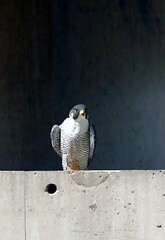 She missed the bird and circled back to land on the ledge of the niche one over (to the left) from the nest niche. Oddly, she looked down into the niche and started vocalizing, then hopped down in there. After a minute and a half, she came back out and flew to the next niche over to the left. Same thing – look in, vocalize, hop in, out in about a minute and a half. This was pretty quirky behavior. When I later shared it with Mary, we considered the possibility that the niches are actually connected at the base. At this stage, the chicks would be moving around a lot in the nest and they may have moved into the next niche. I’m guessing we’ll never know, unless the prison people decided they’d like us crawling around their air ducts. One could always hope. So, let’s check in on chick development. Our chicks should have a nice, dense, long growth of down by now. Some of the flight feathers (remiges) should by breaking through the feather sheaths and more tail feathers (rectrices) are coming in. The beak and legs are starting to turn a pale yellow at this point as well. Anyway, back to the adults. Towards the end of my stay, Hercules came back to the nest with a bigger bird than usual. Of course, she only had the bottom half, so I’m not sure of the identity. It had very long, bright yellow legs with a very prominent knee and huge, long toes, no webs. 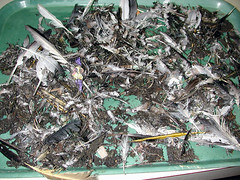 It’s breast/belly feathers were white with brown and black mottling. So, some sort of shorebird. James and Tom made the day really cool, though. As I’ve mentioned before (I think), I’d been eying all the prey scraps on the stairwell roof for some time, but had no way to get up there. I’d mentioned my problem to Tom and James in passing and they said they’d help. While I was on the roof this morning, they came up with a ladder. James climbed onto the stairwell roof and swept everything up there into a big garbage bag while Tom steadied the ladder. What cool guys! Tom was really tickled and said, “Hey, this is great! I get to help with a scientific study!” I need to figure out something nice I can do for the guys. I hustled back to the museum and Mary and I laid the remains out on a lab table. 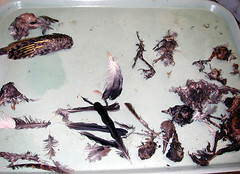 We started sorting, picking out heads/skulls, larger pieces and identifiable feathers. Soon, John Bates (my boss, Head of Zoology) and Dave Willard (Head of Collections) joined in and the four of us managed to sort the mass of prey debris. As gross as it all looks, it did provide some interesting notes to put into my little prey study. Hercules and Max had eaten a number of different birds on that roof spot. We found the wing, head and feathers of a Northern Yellow-Shafted Flicker (in the Woodpecker family – Picidae), an American Robin’s head, lots of pigeon, warbler and starling feathers (and a head or two), a grackle tail and mourning dove feathers and a bunch of Whip-Poor-Will feathers (in the Nighthawks/Nightjars family – Caprimulgidae). ~ by Steph on May 19, 2006.